The tipping point is near. Now that science is confirming all the medical properties of marijuana, it is more important than ever before for governments to legalize it worldwide. The truth of its therapeutic value is out, with new evidence emerging almost daily. Prohibition is now a crime against humanity, as billions of people suffer needlessly because the law denies them access to it. 1.Tobacco and alcohol are more dangerous than weed. 2.Banning marijuana is a very expensive failure. 3.Prohibition just incentivizes and enriches criminals. 4.Outdated laws harm youth and minorities the most. 5. Legalization protects children more than prohibition does. 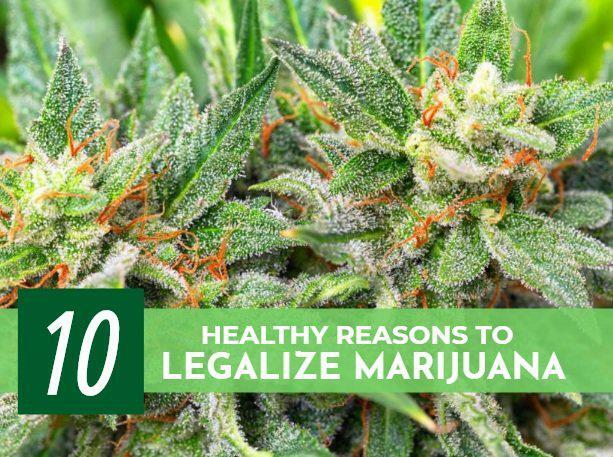 6.Cannabis has an array of safe, effective medical uses. 7. Marijuana can reduce reliance on Big Pharma and its dangerous drugs. 8. Legalization would unban industrial hemp and its many economic opportunities. 9. Cannabis can generate billions in tax revenues. 10. Legalizing marijuana just works. Our society is so backward that tobacco and alcohol, two of the most harmful substances on earth, are legal and cannabis is not. These two substances alone kill nearly half a million people every year, causing countless injuries and illnesses in millions of others, which costs everybody in healthcare costs, law enforcement expenses, and lost productivity. In more than 7,000 years of recorded history, nobody has ever died from marijuana. It is completely non-toxic and actually good for human health. Back in 1937, the federal government forced the Marijuana Tax Act on civilians, its first nationwide attempt at banning pot use. Maybe a few hundred thousand folks were lighting up back then. Today, it is likely that everyone has tried it at some time or another. Despite prohibition, more people are using it than ever before. It has been a dismal failure, and a costly one at that. Taxpayers have forked out more than $1 trillion to incarcerate over 25 million pot smokers since then, all to no avail. Organized criminals have long been making lucrative profits from the illegal drug trade. In states that have legalized weed, domestic product is undercutting imports in both quality and price. Cartels have seen profits plummet from $100 per kilogram to less than $25. Although legalization will not stop criminals, they are turning to other crimes for money as their customer base shrinks. Pot is the most widely used of all drugs, and violent criminals are not following regulations or paying taxes. The United States is finally dealing with institutionalized racism in its criminal justice system. Banning pot has been a main driver of that racism, with African Americans four times at risk of arrest for weed violations than white folks, despite them using and selling pot at similar rates. Police earn incentives in drug grant dollars for arrests, leading them to target minority communities and youths to make an easy buck. Legalization will not change racial profiling, but it will provide fewer opportunities for it. For four decades now, high school kids have been claiming in the Monitoring the Future survey that getting their hands on weed is very easy for them to do. Pot dealers have no need to check I.D.’s, and they do not lose licenses for selling to kids. Determined children will find weed no matter what anyone does to try preventing it. Legalization makes weed safer, of better quality, and moves sales into secure, adult-only stores, ultimately reducing the ease with which minors can get it. Despite medical marijuana being legal in most states now, still thousands of people go to jail for using it each year. In California alone, where almost anybody can get a doctor’s letter and carrying an ounce with you is just a $100 fine, more than 2,000 people still end up in prison. Visiting a doctor costs money, as does a medical card. Not everybody can afford it, and even if they did, it should be legal for them to treat their health issues as they see fit, with safe and effective alternatives to harmful prescription pills. A deadly opioid epidemic is sweeping across the United States. Every year, legal pharmaceuticals kill far more people than all illegal substances combined. Marijuana costs little to grow and can easily replace more than 17 of the most dangerous cocktails sold by Big Pharma. Legalizing it can literally save millions of lives and end the misery of addiction. Big Pharma fears legalization, lobbying politicians and funding anti-weed campaigns at every turn. Since the battle is almost lost, it is now synthesizing cannabinoids. The United States is so lunatic that it actually prohibits hemp, despite the fact that it is non-psychoactive. It cannot make anybody stoned, but the government bans it anyway simply for resembling marijuana. Industrial hemp can revitalize the American economy. From food to fiber, medicine, fuel, building materials, clothes, renewable energy, and so much more, hemp can revolutionize almost all industry, and sustainably to boot. It would create hundreds of thousands of jobs, as well. Marijuana is a commodity, and a hot one at that. Like all commodities, regulating and taxing it could be lucrative business for the government. The weed market is only going to continue skyrocketing, so it makes sense to give it to law-abiding, taxpaying, job-creating companies, instead of to criminal, police-corrupting, murderous cartels. In states that have legal laws, it is already generating billions of taxes, which are now funding crucial programs, maintaining infrastructure, and prospering communities. Legalization is no longer some hypothetical idea. It is legal recreationally in nine states already and medically in more than half the country. Statistics are available now, and despite initial hurdles, such as children and edibles, supply and demand, data shows that it works, and it works well. It is creating jobs, saving lives, making money, reducing crime, ending opioid addiction, and so, so much more. People are living better lives because of it, and there are notably fewer sick people around. With public support not just increasing, but also actually demanding legalization, the federal government has no choice but to comply with the masses. Experts predict that weed will be legal nationwide inside of three years. However, many suspect the delay about powerful business interests lobbying the government for full control over it. If we stand together, we can still make it free for all. Dorothy Watson writes for Pot Valet, the most popular of Santa Monica dispensaries and a leader in the weed delivery industry. He advocates for legalization worldwide and access to cannabis for all, with focus on educating everybody about the benefits of marijuana. Get To Know more about Acne Visit at Fact Dr Rate this post Checkout & Read also: What are the Acid Reflux Disease Causes?